It’s during evenings like this that I’m reminded of why I fell in love with Jack. Charming, amusing and intelligent, he knows exactly what to say and how to say it. Because Esther and Rufus are newcomers, he makes sure that the conversation as we eat our souffles is for their benefit. He prompts Diane and Adam into revealing information about themselves that will help our new friends, such as where to shop and the sports they play. Although Esther listens politely to their list of leisure activities, the names of their gardeners and babysitters, the best place to buy fish, I know that I am the one who interests her, and I know she’s going to return to the fact that Jack and I have relatively late to marriage, hoping to find something – anything – to tell her it is not as perfect as it seems. Unfortunately for her, she’s going to be disappointed. Behind Closed Doors is a beautifully written debut that captures your imagination from page one and doesn’t let go until the end. It gets under your skin and in your head. You know it’s good when you imagine what you would do in a similar situation and it causes real life nightmares. 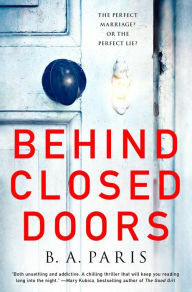 It’s been a long time since I read a psychological thriller that lived up to the genre, but Behind Closed Doors does that and more. You can easily read this in one sitting, but I broke it up over several reading sessions to make it last longer. Behind Closed Doors is the perfect end of summer thriller with a deeply gratifying ending! You won’t be disappointed.